This Curie constant calculator helps you calculate the Curie constant. The Curie constant characterizes a response of a paramagnetic material to the magnetic field. Keep on reading to learn more about the Curie constant equation and the Curie's law of magnetism. M = C/T * B. To learn more about the Curie's law check the Curie's law calculator. Here we focus on the Curie constant C and its dependence on the properties of the material considered. μ [J/T] is the magnetic moment of a single atom. The unit of the Curie constant is [K * A/(T * m)]. The magnetic moment μ is a characteristic number describing a magnetic property of a single atom (or a particle, molecule, etc.). You can learn more about the magnetic moment in quantum mechanics checking the Magnetic moment calculator. You can quickly compute the Curie constant with our calculator. To simplify the computations we set the units of the lattice constant a to nanometers. Nanometers are an appropriate unit to describe the atomic world. For the same reason the magnetic moment μ is in the Bohr magneton μB = 9.274 * 10^(−24) J/T units. For example, let us consider we take a crystal formed by atoms on a simple cubic lattice with a lattice constant a = 0.2 nm. In a simple cubic lattice there is one atom per unit cell. We assume that each atom carries magnetic moment μ = 2 μB. 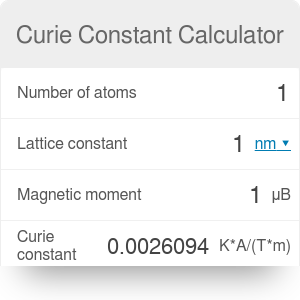 With the Curie constant calculator, we get that the Curie constant C = 1.3047 K * A/(T * m). Curie Constant Calculator can be embedded on your website to enrich the content you wrote and make it easier for your visitors to understand your message.